People’s perceptions and understandings of climate change determine their response and adaptation measures to climate change. 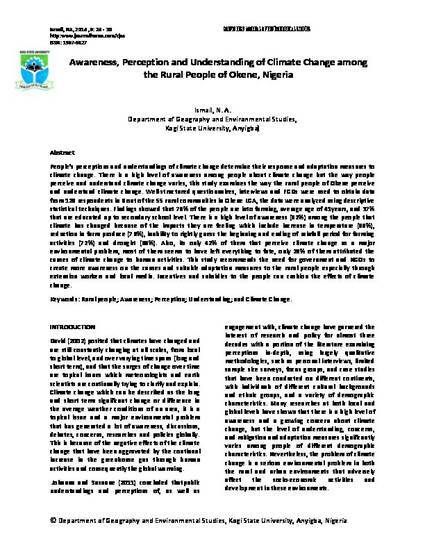 There is a high level of awareness among people about climate change but the way people perceive and understand climate change varies, this study examines the way the rural people of Okene perceive and understand climate change. Well-structured questionnaires, interviews and FGDs were used to obtain data from 129 respondents in 6 out of the 55 rural communities in Okene LGA, the data were analyzed using descriptive statistical techniques. Findings showed that 78% of the people are into farming, average age of 41years, and 37% that are educated up to secondary school level. There is a high level of awareness (92%) among the people that climate has changed because of the impacts they are feeling which include increase in temperature (89%), reduction in farm produce (76%), inability to rightly guess the beginning and ending of rainfall period for farming activities (72%) and drought (68%). Also, its only 42% of them that perceive climate change as a major environmental problem, most of them seems to have left everything to fate, only 28% of them attributed the causes of climate change to human activities. This study recommends the need for government and NGOs to create more awareness on the causes and suitable adaptation measures to the rural people especially through extension workers and local media. Incentives and subsidies to the people can cushion the effects of climate change.